For over a year I’ve been searching for a few decent backsaws I could use for dovetails, tenons, etc. I quickly found that the vintage route was not going to turn anything up as quickly as I wanted, so I figured I would see about buying my first brand new woodworking tool. After quite a bit of research, I settled on Lie-Nielsen. I seriously contemplated the Veritas saws as they seemed to have good reviews and were half the price, but I just couldn’t get past the look of the saws. I know, dumb reason to disqualify a tool, but I have found that part of the hand-tool experience (for me anyway) is in the look and the feel of the tools I use. Hence, the beautiful LN decision. 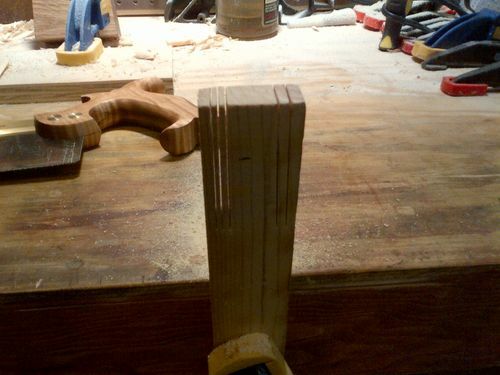 I went with the Carcass saw filed rip because I didn’t have the budget – ok, I didn’t have the guts to ask the wife for the budget – for 2 saws, and I knew that dovetails AND tenons were in my future, so I decided on the slightly bigger cut capacity of the carcass. Enough about the decision making process. Lets talk about the tool. 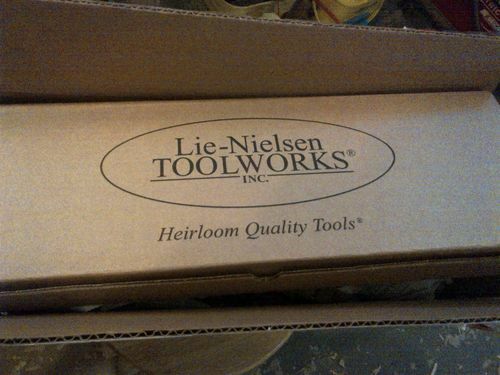 I ordered the saw at a Lie-Nielsen event in KC, and it was shipped to me by the promised date. 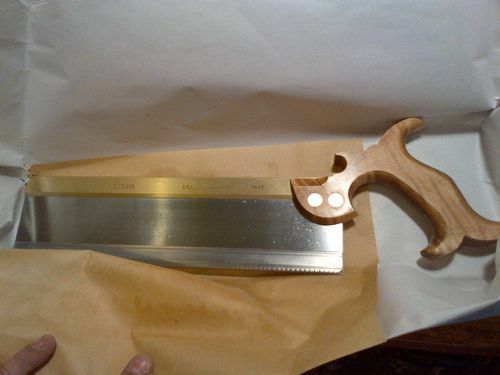 Unfortunately, the saw got stuck in a pretty heavy snowstorm that hit the Northeast, so delivery was delayed by a day – that’s not LN’s fault, so no complaints there. Upon receiving the saw I immediately noticed the care in packaging. A box inside of a box, stuffed with old newspapers as packing material. The saw was wrapped in butcher paper, as well as a corrosion-inhibiting paper. Excellent packaging. 5 stars for that alone! Take note – I am a complete amateur at sawing, and have a heck of a time sawing to a line, starting the saw, etc…None of that was evident when I grabbed a piece of pine and started sawing with this saw. Even with my lack of skill, I was able to start the cut easily, and once the saw was started it tore into the pine like it was butter, ignoring my shoddy form and refusing to cut anything other than a straight line. The saw is amazingly sharp, and is an absolute joy to use. The beautiful curly maple handle, brass spine, and polished plate all combine to please the eye. The handle fit my hand like a glove, and the weight and balance of it all makes it hard to set the saw down. Even my wife thought it was a work of art! After about 3 days sawing into everything I could find, I tried dovetails…yeah, they are freaking hard to execute, but the sawing part – surprisingly easy with this saw. For a rank amateur with absolutely no skill, experience, or knowledge, I rate this saw as the best experience I’ve had with a tool so far. Clean cuts, straight cuts, easy to start, a joy to hold, and beautiful. I will be purchasing a crosscut joinery saw soon, and the decision will be easy for me now – I will definitely buy Lie-Nielsen again! I highly recommend this saw for anyone – especially amateurs. Worth every penny! You’re wise to purchase quality. Thanks for the excellent review. Nice looking saw, glad you are happy with the purchase. Thanks Shane, waho6o9. I’m happy with it for sure! As a beginner, I’m glad I didn’t get a lesser quality saw because its results may have discouraged me from the craft…thats something I fear constantly, that I’ll get discouraged and give up this journey. 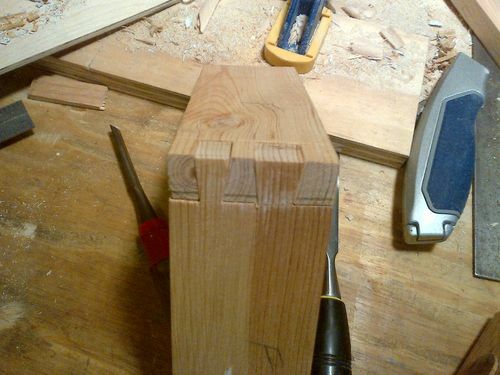 And thanks for the nod on the dovetails…I was happy with them since they were my first, but they are far from where I want them! Nice review Jason, and with dovetails like that, I’m not buying the whole “no skills” thing. I agree. There is nothing like the look and feel of a great tool. I use the carcase saw filed for cross-cuts plus the dovetail saw. They are my “buddies”. Great saw! my first saw was the LN dovetail saw. I am getting another LN saw soon. A tenon saw 16” hopefully, just got a deal on a Stanley brace today, going to handwork for fun and better family time aithout machine noise! Great revie and hard to argue the Quality from LN. Love there stuff and would love to have all there tools in the shop. LOL Well done and congrats on learing dovtails. TDog, that 16” tenon saw is a WONDERFUL saw. I picked up one at the Seattle hand tool event recently and it cuts like butter. Great post carguy! I’ve been reviewing backsaw’s myself and would really love to get my hands on a BadAxe saw but am having a hard time coughing up that kinda dough. I’m glad to see you found this to be comfortable since this one is also on my short list. I too am also an amateur hand tool guy so its good to hear you’ve found this tool to help make up for your lack of skill. 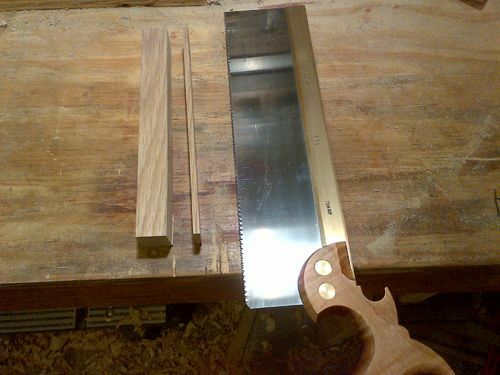 TDog – let us know when you get the tenon saw! That saw is on my list, right after a crosscut carcass saw! And good call leaning towards the hand tool side of things…I agree with the family-friendly aspect of it, noise wise and safety wise! Ken – thanks for the kind words! LN is definitely top of the line stuff, I’m proud to own a small piece of their lineup. Clafollett – Bad Axe saws did cross my mind during my saw hunt, and I am confident that they are quality saws worth every penny. I may purchase one in the future, but for now I am sold on the LN quality and customer service. Good luck with your hand tool journey, and let us know what tool you decide on!